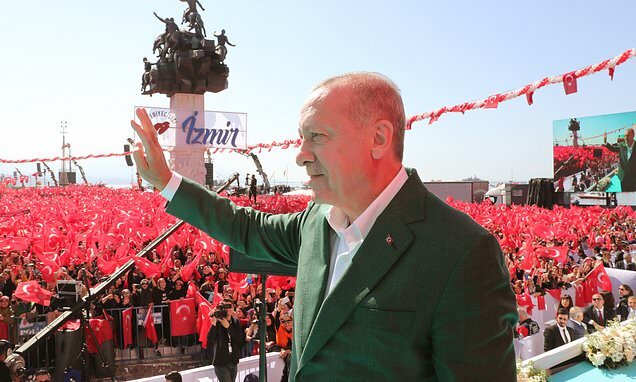 Erdogan told supporters in Izmir that the gunman who killed 50 people at two mosques in New Zealand had wanted Turks removed from Europe. Alleged mass murderer Brenton Tarrant shared footage of the horrific killings in a Facebook live stream, parts of which were shown to the Turkish crowd on a big screen ahead of local elections later this month. But Erdogan's use of the footage drew criticism from New Zealand's foreign minister Winston Peters, who said his country should not be 'misrepresented'. According to BBC News, he went on: 'Anything of that nature that misrepresents this country - given that [the suspect] was a non-New Zealand citizen - imperils the future and safety of the New Zealand people and our people abroad and it's totally unfair. Erdogan said the suspect had twice visited Turkey, and had warned that Turks have no place in Europe.